Most island chains rest on foundations that are arc-shaped and include tall volcanic mountains. Are they evidence for a traveling electric discharge? 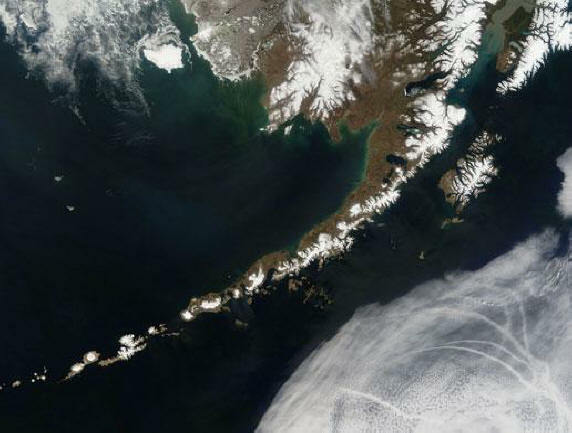 The Aleutian Islands reach out from the Alaskan coast for 2800 kilometers, extending all the way to Kamchatka in northeastern Siberia. The islands curve along a convex path toward the south and are said to ride on a tectonic plate whose boundaries stretch northward from the Wrangell Mountains. Conventional geological theories propose that island arcs are created when oceanic plates are either subducted under another tectonic mass or crash together as they slowly travel around our planet. The tectonic plates might also include "accreted" crustal material, known as terranes, from other plate boundaries, which would make the plate more "buoyant", causing it to ride over the edge of a neighboring plate. Other plates that are composed of strictly oceanic crustal material are said to be of greater density, so they descend below the less dense continental slabs. These regions occur around the northern and western Pacific plate where the North American, Eurasian and Indo-Australian plates are being "dragged down" into the mantle. Because both plates sometimes include continental material (the Indo-Australia subduction zone under the Eurasian plate, for instance) the theory continues to evolve as more research is conducted. No one is actually certain about how the process proceeds. As the prevailing theory of sea-floor spreading states, however, volcanic islands rise from the ocean floor due to subduction of the oceanic plates. Water-bearing minerals release their vapor when the subducting plate melts as it approaches the mantle, causing plumes of molten magma to rise up towards the surface. The magma then erupts along the moving plate margin and is extruded onto the ocean floor where it slowly grows an arc-shaped island chain. The Hawaiian Islands are often used as an illustration for how a "hot spot" on the edge of an overriding plate can form island arcs. In previous Thunderbolts Picture of the Day articles about various anomalies associated with continental formation and sea-floor spreading, several aspects of the theory were called into question. The most important problem with the theory of plate tectonics is that the power required to move continental landmasses around has not been adequately explained. Thermal convection is said to circulate heat energy from the Earth's interior, but there has been no process developed for how the spreading began. Why did it take almost 2.5 billion years for the crust to begin cracking and melting? Other issues that have not been addressed include: the existence of spreading zones without corresponding subduction zones into which the crust can sink, a theoretically lower-density plate sinking under the Alps, sediment anomalies in the mid-Atlantic basin, and continental rock that is thick and elastic under mountain ranges yet thinner and more brittle than the oceanic crust in the spreading zones. In the Picture of the Day article about the Sea of Japan, it was noted that the Japanese archipelago and the deep ocean trench that borders its eastern edge follow a sinusoidal path. 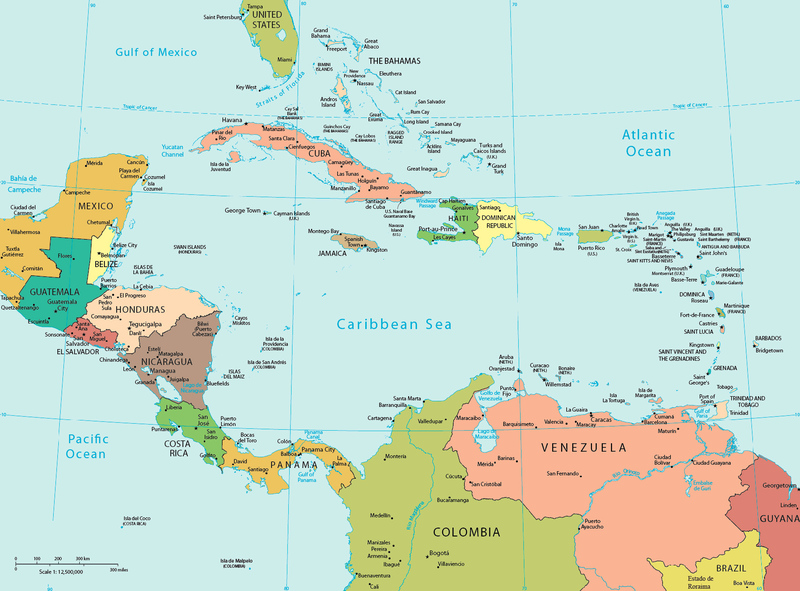 Upon closer inspection, other island groups appear to have similar morphology: the islands of Oceania, the Caribbean Islands and the Bahamas (including Key West) are three examples. While these island chains are visible above the surface of the sea, it is necessary to consider those seamounts that do not break the surface as well. There are many instances where topographical maps of the ocean bottom describe arc-shaped configurations. Indeed, the Aleutian Islands reveal many unusual underwater formations: backward-curling loops, dual-ridge canyons, criss-crossing fractures, and wide, flat plains with terraced, vertical walls. No matter how many times slow-motion, uniformitarian geological theories are tortured, they have never adequately accounted for these features. As these pages have repeatedly shown, planets and moons exist within the electric fields of space. In times past, it is possible that those fields were much stronger in their influence than we experience today. Another highly charged object from space could have approached close enough to induce electric discharges between itself and the Earth. If the power involved was great enough, the plasma bolts could have lasted for minutes or even hours, traveling through Earth's conductive strata with catastrophic results. Mountainous uplifts, compression of the lithosphere, trenching, cracking, folding, tilting and other deformations in the Earth's surface are most likely not due to incremental changes over hypothetical million-year time spans. Instead, island arcs with their attendant volcanoes and steep, deep canyons were probably created in much the same way as the other large-scale formations we see, through the agency of planetary lightning bolts and corona discharges.